Fleetwood Town coach Paul Murray says John Sheridan’s record at Highbury means he should have an opportunity to be in the hotseat for the start of next term. Sheridan signed up to a short-term deal when he took over the reins from Uwe Rosler in February. Not only has he guided Town to League One safety but he has done it in style with six clean sheets, six wins and one defeat in nine. Murray said: “I think with the record he has got, surely he must have an opportunity to take the club forward and be here next year. “That is nothing to do with me but with that record he has got already it is a fantastic chance. “It is going well and the results speak for themselves. “I know the gaffer from when we used to play together at Oldham and when he first took his management job I was still playing at the time. “I’ve known him for a while, I know how he works, he is honest and open about it. “We are safe now and it is brilliant for the football club. “I think he has just been honest, asked the players what he wants from them positionally and what he expects and they have delivered. 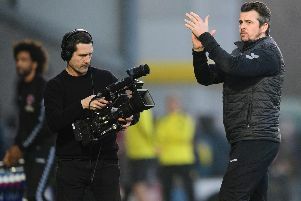 Murray was speaking after Town’s development squad lost the Lancashire Senior Cup final for the second year in a row with a 4-2 defeat to Bury. It was a game marred by a suspected broken jaw to goalscorer Ged Garner following an aerial collision with Saul Shotton. Murray said: “It is a nasty injury for him. He went to hospital; looks like it will be an operation. However, Murray was far from impressed by some of the first team players who also featured. Chris Neal, Charlie Oliver, Joe Maguire, George Glendon, Harrison Biggins and Markus Schwabl and Wes Burns all started at the County Ground in Leyland but Murray felt they did not take their opportunity. He said: “I’d expect the senior lads that have stepped down from the first team to give us a little bit more. “The gaffer was there, the chairman was there, you have got an opportunity because we are safe now but I don’t think too many took it.